I Kings 3:9a (NIV) - So give your servant a discerning heart to govern your people and to distinguish between right and wrong. Taking Care of Me: Where is my shirt? 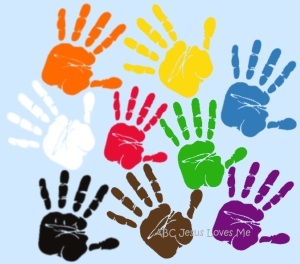 Handprint Wall - Add a green handprint to your color wall by painting the child's hand and stamping it onto a piece of paper. Write the name of the color on the handprint. Display it at the child's level to point and discuss the colors. Play Dough Shapes - Roll green play dough into snakes and lay on the Square worksheet to form a square. Allow the child to play with the square as you discuss the shape. 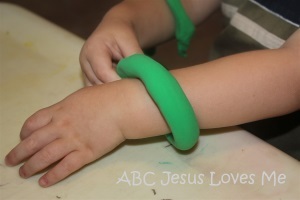 - Spread a thin layer of glue on the Turtle worksheet. Lay small green tissue paper squares on the turtle. - Find pictures of turtles in the books that you read. - Look for items in the book that are square in shape. 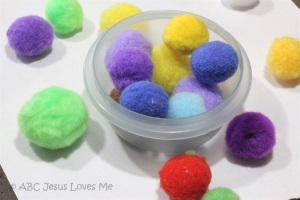 Pom Pom Transfer - Create a small pile of pom poms on the table or floor along side a shallow container. Demonstrate to the child how to pick up the pom poms and place them in the container. Continue instructing the child to pick up her toys before getting out new ones. Assist the child in carrying the toys back to their resting place.